Wonderful. Like all Waterhouse, there is much being said here. The fallen cup is redolent of the grail, and the colour of the spilt liquid, red, adds to the Christian redemptive symbolism. The sorceress is doubting her destiny and the path she has chosen to take. It is a moment of truth. Great picture, I love Waterhouse. 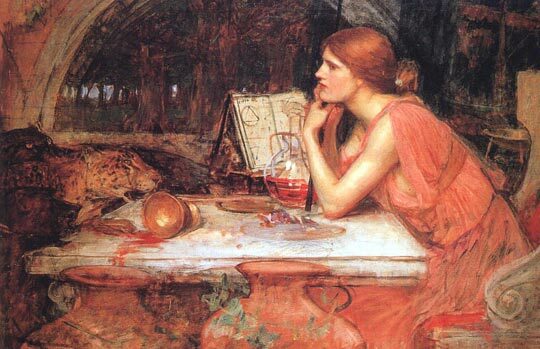 Love this painting, love Waterhouse; he is one of my favorite artists! We have an exposition of Waterhouse's work in Montreal now and it's amazing. I'm going back to see it again this weekend!